Concern about corruption in South African higher education has mounted in the aftermath of the murder of a senior scholar who tried to blow the whistle on academic fraud. Gregory Kamwendo, dean of arts at the University of Zululand, was shot and killed outside his home in May last year. Two men appeared in court in December charged with his murder and one, Solly Nkuna, was an academic and former colleague of Prof. Kamwendo. One line of investigation is believed to be that Prof. Kamwendo may have been targeted after he uncovered how Ph Ds are being fraudulently awarded at Zululand, an 18,000-student institution on South Africa’s eastern coast. Belinda Bozzoli, South Africa’s shadow higher education minister, told Times Higher Education that the murder of Prof. Kamwendo is the latest twist in an “ongoing saga” of problems at Zululand. Academic corruption in South Africa had got to a “particularly bad point if people are prepared to kill for it,” says Prof. Bozzoli, former deputy vice chancellor of the University of the Witwatersrand. In a statement, Zululand condemned “speculations” over the murder. However, it added that managers — including Prof. Kamwendo — had discovered “procedural and quality shortcomings” among presented dissertations and theses, which had resulted in disciplinary procedures against supervisors and academic staff at the institution. Zululand is not the only South African institution under scrutiny. In November, the South Africa Human Rights Commission concluded that there are “systematic, institutional challenges” at the University of South Africa related to bullying, favouritism in appointments and harassment. In December, allegations of degree fraud surfaced at Zululand’s neighbouring institution, the University of KwaZulu-Natal. 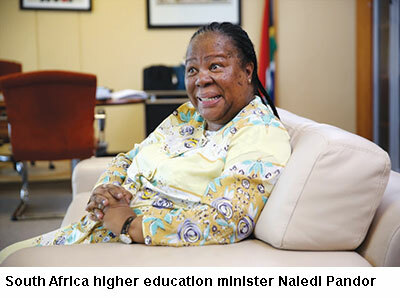 Naledi Pandor, South Africa’s higher education minister says it’s “clear there are criminals outside and within our university system who will stop at nothing to use our universities for financial gain”. Arguing that universities “should be battlefields of ideas, not battlefields of corruption”, Pandor describes the threats to academics as a “grave concern”.